The Norwich Terrier is a perky and eager working dog from England. This is also one of the smallest terrier breeds - they're generally around 10 inches tall at the shoulder and weigh around 12 lbs. The Norwich Terrier is almost the same breed as the Norfolk Terrier - the difference is that the Norwich has upright ears and the Norfolk has dropped ears - and the two varieties were considered one breed until a few decades ago. 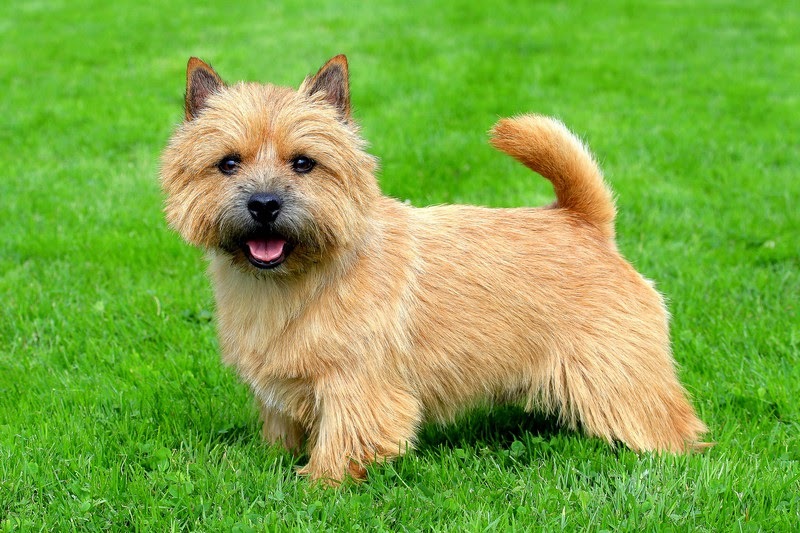 Traditionally, Norwich Terriers were used to hunt vermin and foxes, and the breed still has a strong hunting instinct. They're known for being fearless, loyal, and curious, and they adapt well to different situations. These dogs are active and require exercise. Like all working dogs, they're happiest when they have a job to do, and many Norwich terriers compete in obedience, agility, and other types of dog sports. While Norwich Terriers are generally good with other dogs, cats, and children, owners do well to remember the strong hunting instinct. Rabbits, gerbils, and other small rodents might be considered prey. This is not a breed that should be let off leash outside a fenced yard. Given the opportunity, they will chase squirrels, bolt out through an open gate, and dig holes for entertainment. They're intelligent, eager to please, and love their families, but instincts bred in through generations are difficult to shake.